As subscribers to our weekly newsletter know, each week our Displaced Dispatch presents an “Alice Award” to a writer who we think has a special handle on the curious and unreal aspects of the displaced life of global residency and travel. Not only that, but this person likes to use their befuddlement as a spur to creativity. Today’s post honors July’s four Alice recipients, beginning with the most recent and this time including citations. Nordic Noir meets Cold War Espionage. Pia’s ambitions to win a gymnastics competition between her Helsinki college and a school from Moscow trigger a set of dangerous events when her best friend disappears and a violent KGB spy, The Red King of Helsinki, threatens her. Will a friendly British ex-navy officer, Iain, be able to save Pia before its too late? This fast-moving novel set in Finland has everything—a young, feisty protagonist, Nordic Noir and old-fashioned chivalry. Citation: Helena, how could we not award you an Alice once we heard you’d written a story revolving around a Red King? While we do not know whether you purposely modeled your Red King of Helsinki on the Red King of Lewis Carroll’s Through the Looking Glass, it almost doesn’t matter. The point is, you present us with a classic through-the-looking-glass situation, having set the action during the Cold War and made your Red King into a Soviet spy. Will Pia/Alice checkmate the Red King with the help of that kindly British military gentleman? Or will she go out—bang—like a candle? No need for Tweedledum/dee to explicate. What’s more, you are the perfect person to take us on this particular fictional journey. With your thick blonde locks and acute appreciation for the curious and unreal in your adopted country, it’s not much of a stretch to dub you the Finnish Alice! Small self-amputating lizards dart out of my fruit bowl. Ants march in to weightlift a few missed crumbs off my floor. Possums push their cute limits with roof-dancing antics. While the elusive ghost bug remains a mystery, large “harmless” spiders, innocent-sounding paper wasps and alien insects get the boot or get spiked by my neighbour’s stilettoes. It’s just a few of the ways to deal with uninvited houseguests in the subtropics. A friend sent me the link to a BBC report about American food officials declaring French cheese “filthy” and inedible. The funniest thing was that it was Mimolette, a hard Edam-like cheese that even I as a Brit find a bit bland. It’s usually sold in small semi-circular slices with a curve of rind, or the kind of rectangular rindless blocks that you would think the Americans might enjoy. It’s the last cheese you would expect to get an import ban. Art is uncertain. Sometimes, in order to feel the delicious comfort of certainty, you might try to make art while grasping onto some idea or technique that seems safe. If you do that, your writing will come out stiff and contrived because you’re not creating, you’re imitating. Loosen your grip. Let go of control. Embrace the freefalling sensation of having no idea where you’re going with something. Good art comes from risk, experimentation, and play. Citation: Torre, we love the way you took your own advice and embraced the free-falling sensation of having no idea where you were going when you fell for a handsome Argentinean man with a humble sailboat and agreed to join him in pursuing the dream of setting off to explore the world, this despite your morbid fear of water. You’ve had a series of adventures to rival Alice’s. Also like her, you’ve lived to tell the story for subsequent generations of wannabe free-falling adventurers, via both your highly successful blog, which you aptly refer to as a “literary potluck party, Mad Hatter style,” and now memoir, Love with a Chance of Drowning. Kudos! 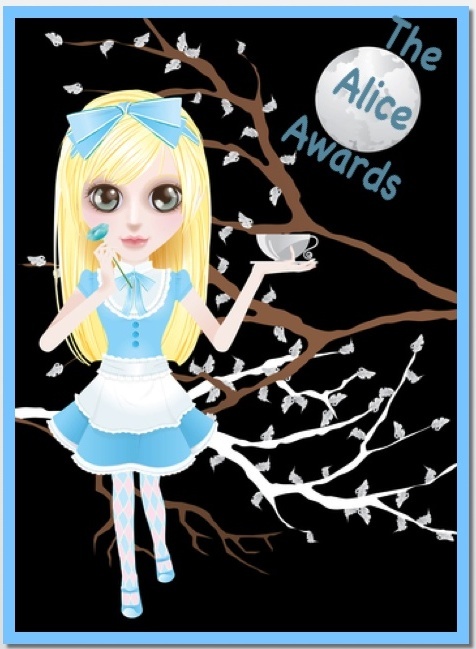 So, readers, do you have a favorite from the above, and do you have any posts you’d like to see among August’s Alice Awards? We’d love to hear your suggestions! And don’t miss out on these weekly sources of inspiration. Get on our subscription list now! Wow, thank you so much! I am absolutely thrilled! Well, if you’re going to use the red king analogy, it’s a shoe-in. But seriously, and as you know, we are big fans! Me too. Thanks for the award. I’m honoured to be part of your befuddled, displaced motley crew and fully signed up to your constitution. Wonderful, thanks for signing up! We in turn are honored to have you in our midst!